Maria Theresa, the empress who ruled Austria in the 18th century, fell in love with these Bohemian chandeliers. In 1746, a new, lyre shaped chandelier was delivered to her palace and Maria Theresa was literally bedazzled. Since then, this type of chandelier has boasted her name. 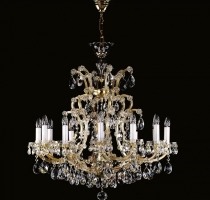 Maria Theresa chandeliers have flat steel arms coated in either golden or silver bronze. Each arm is fitted with crystal strips on both sides following exactly its curvature, and secured with crystal rosettes. The steel frame is designed so that it is able to bear the most daring dimensions with any number of pendants. You will evoke the atmosphere of royal palaces in every interior with light fittings of the Maria Theresa type. All chandeliers in this line can be customized and are available in yellow (Brass) and silver metal (Nickel). Height given is without the chain, which gives another 30 cm (1foot). All chandeliers are wired for 220 V, except for orders from USA, where the wiring complies with the US standard 120 V.